Because the nights are drawing in here in the Northern Hemisphere and because so many people now have iOS and may not have experienced the wonders of extensions, we are offering ShareEverywhere for half its usual price for just a few days! In case you’ve not seen it before, ShareEverywhere is an all-in-one share extension for iPhone and iPad. 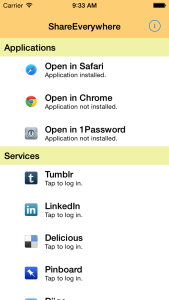 Using a single app, you can share links and images with over a dozen services or apps. Given the bug in iOS 8 where the order of extensions is rarely remembered, doesn’t it make sense to have a single extension that does everything?